Athens, Greece -- As a consequence of the disqualification of Vincenzo de Blasio's Scugnizza by an International Jury convened after receiving an allegation of gross misconduct, a new winner is declared for Class C in the 2016 ORC European Championship regatta organized by the Nautical Club of Thessaloniki and the Offshore Racing Congress. The Jury decision was that Scugnizza was in breach of rule 69.1(a) and thus disqualified from all races of the championship regatta held in Porto Carras, Greece over 3-10 July 2016. Therefore Aivar Tuulberg's Arcona 34 Katariina II from Estonia has been elevated from runner-up to being the new 2016 ORC Class C European champion. Another Estonian entry, Ott Kikkas's Italia 9.98 Sugar is the new Silver medalist and Baxevanis Athanasios's X-35 OD Baximus from Greece is the new Bronze medalist. "This decision was difficult and long in coming, as it involved complex issues related to sailing trim, yet we applaud the Jury for upholding the integrity and principles of both our rules and the rules of the sport," said Bruno Finzi, Chairman of ORC. Prize giving ceremony will take place tonight in Olympic Hall at 21:00. After the ceremony, there will be a wine reception in the marina area (in front of port captain's office). Course selection for offshore race. Race areas for the start of the offshore race (6/7/2016) are Alpha for class AB and Bravo for class C.
Time limits and scratch sheet available here. Practice race is now complete, results here. North Aegean Cup is the major regatta organized every year by the Nautical Club Thessaloniki in Porto Carras Grand Resort . This year North Aegean Cup will take place from June 30 until July 3, forming the test event for the ORC European Championship. We invite teams to enter North Aegean Cup and have the opportunity to get acquainted with the race field beforehand, do some real training and get adapted with the wind conditions, perform measurement checks, and -why not- win a prize! The Notice of Race has been published in North Aegean Cup website. Hotel Meliton: Special price of 149,00€ per night, double room, including breakfast. Hotel Sithonia: Special price of 167,00€ per night, double room, all inclusive. 50% discount on Porto Carras Marina fees for the period after the ORC European Championship until the Aegean Regatta 2016, also starting from Porto Carras Grand Resort . 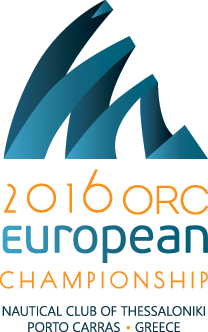 The Nautical Club of Thessaloniki announces the ORC European Championship 2016 from July 3th to July 10th 2016. Races will be held in the Toroneos Gulf and the North Aegean Sea. The start of the competition and the skippers’ meeting will be held at Porto Carras in Halkidiki, which is also the headquarters of the event. Participating boats will be moored in the marina of Porto Carras. 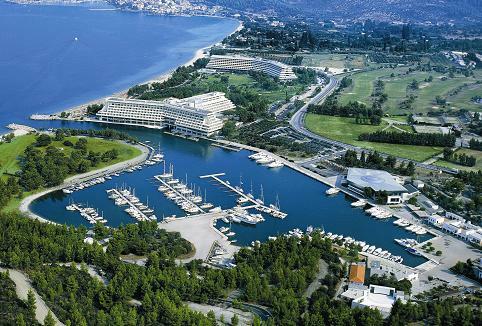 Porto Carras Grand Resort is located in Sithonia peninsula, one and a half hour drive from Thessaloniki, the second largest city of Greece, featuring an international airport and commercial port. Thessaloniki airport is connected with all major European airports with direct flights or via Athens internationail airport. Porto Carras is set alongside sandy beaches and coves, giving teams the opportunity to enjoy world class racing in a luxury holiday resort. The race area is characterized by the thermal breeze appearing every summer day early at noon, the wind varying from 8 up to 16 knots, gradually diminishing after sunset. These mild but steady conditions are ideal for inshore, as well as daylight offshore racing. Racing will feature a mix of round the cans windward/leeward courses and offshore races, to fully test the teams’ skills on the waters of Toroneos Gulf. The challenge of close windward/leeward racing is likely to keep the fleet in close boat on boat battles, compared to the complexity of offshore racing. Interpreting the changing conditions and delivering consistency will reward with Championship success. Social activities for the 2016 ORC European Championship will take place at the race village at Porto Carras Grand Resort, with renowned Greek hospitality throughout the week. A wide range of accommodation choices are available within Porto Carras, which is northern Greece’s largest marina. A huge variety of shoreside entertainment can also be enjoyed including thalassotherapy, spa, numerous restaurants, beach bars, golf together with equipment repair and support services – all set in a stunning luxury waterfront location.